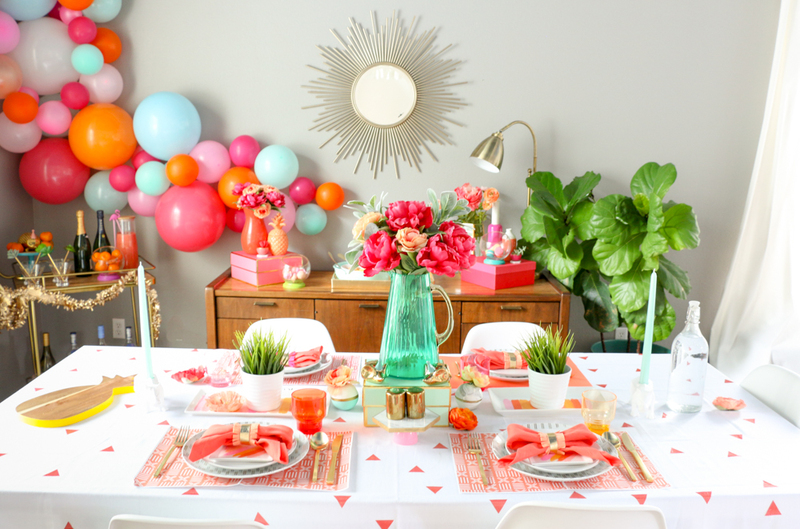 After seeing amazing inspiration from several of my blogger friends (Sugar and Cloth and Pizzazerie) and after having so much fun styling my spring table, I wanted to try my hand at styling a Mother’s Day brunch. 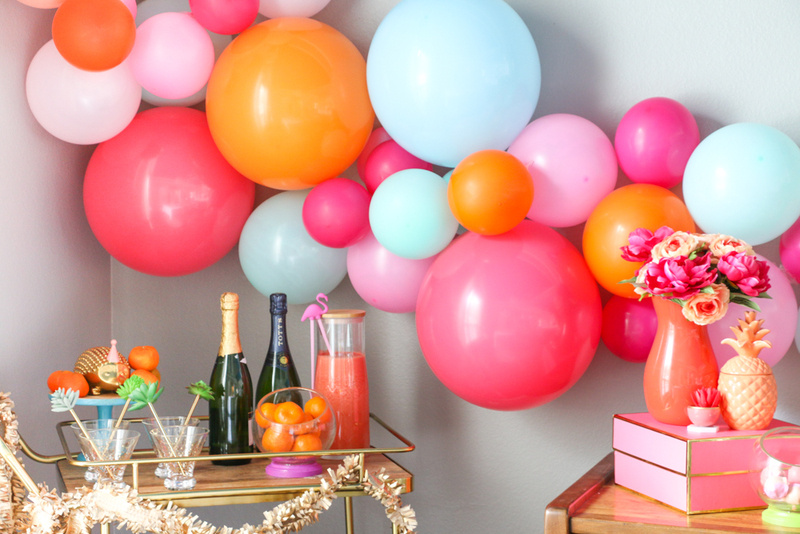 I had so much fun deciding on a color theme and trying my hand at my first balloon arch. I can tell you for sure, that I am absolutely in love with the way this brunch table and bar cart turned out and can’t wait to share all the details with you today. And you better believe this is all staying up until actual Mother’s day when I will be celebrating for with my mom for reals. Let me just start off by saying that I have found my new go to party decorating idea (thanks to the likes of The House that Lars Built and Sugar and Cloth). 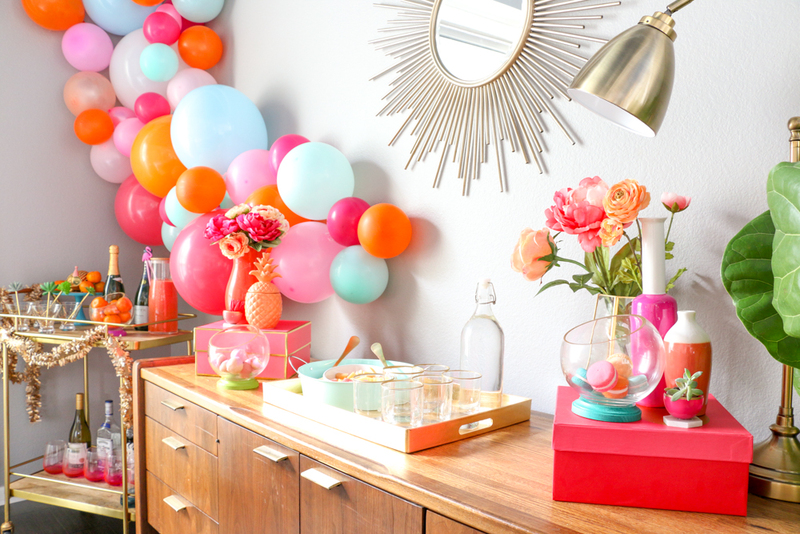 That balloon arch is such a show stopper and makes a huge visual impact. And bonus, it was less than $10. Seriously. I will never underestimate the power of balloons again! I found these large 18″ balloons at Target and the smaller balloons are just a combo of 9″ and 11″ balloons that I blew up to various sizes. And can you guess what is holding the them up? Just thumbtacks and tape. Yep, I am fancy like that. 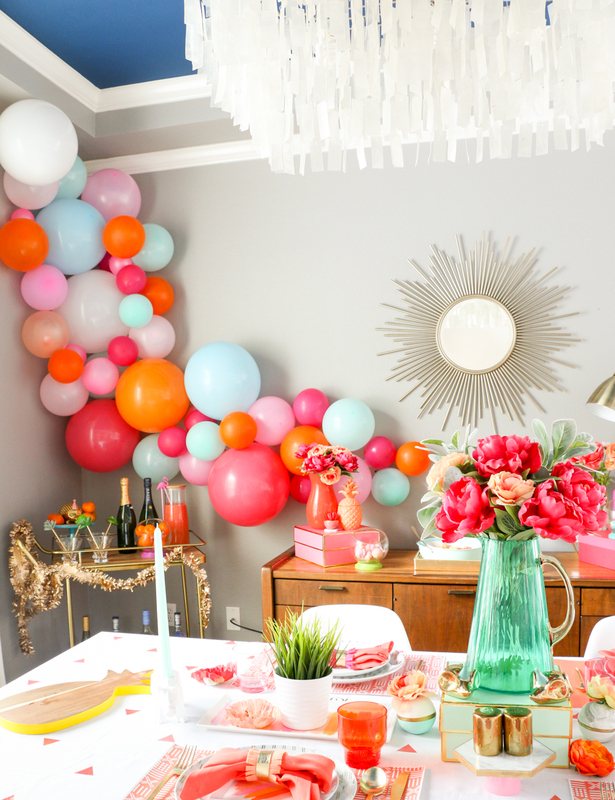 But seriously I used thumbtacks through the end of the large balloons to attach them to the wall, and then used tape folded into loops to stick the smaller balloons in the gaps and fill out the whole arrangement. For the buffet I used two pink and coral boxes as risers and then layered in a few vases with flowers and two bowls filled with sweet treats. In the center is my gold tray that I filled with gold rimmed water cups, a glass bottle filled with water, and a bowl of fresh fruit. Over on the bar cart are my succulent drink stirrers and of course champagne and fresh watermelon pineapple juice for mimosas. Because what brunch is complete without mimosas? 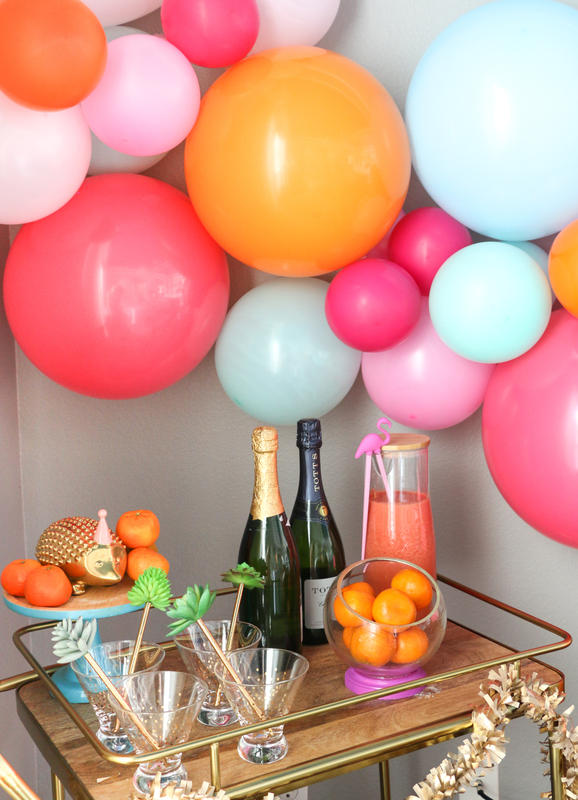 And how cute are all the balloons up there behind the bar cart?! Now onto the table. 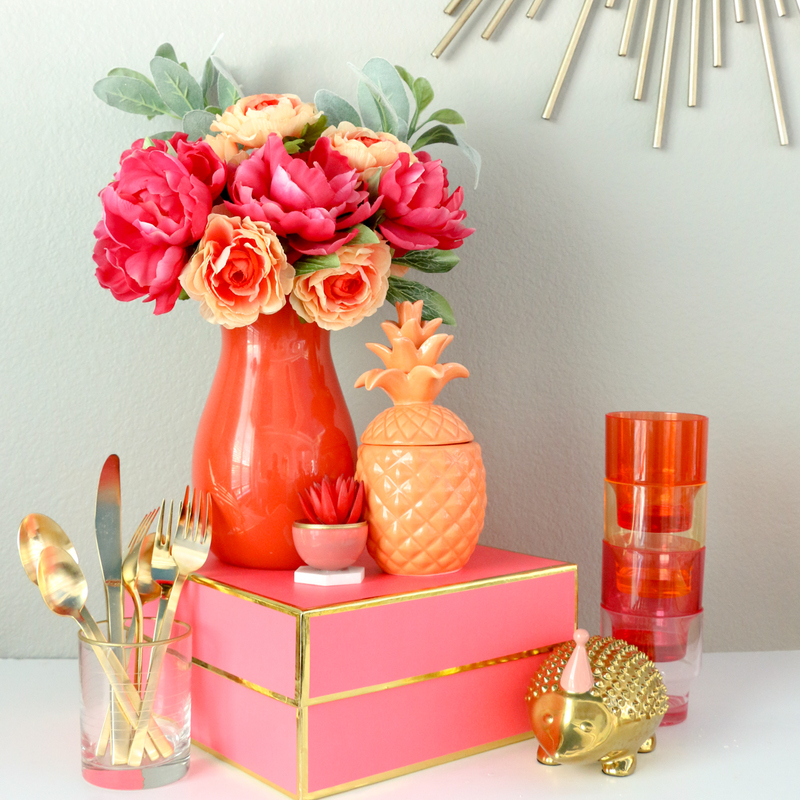 For the centerpiece I used my Oh Joy for Target emerald and gold pitcher and filled it with pink and peach flowers. 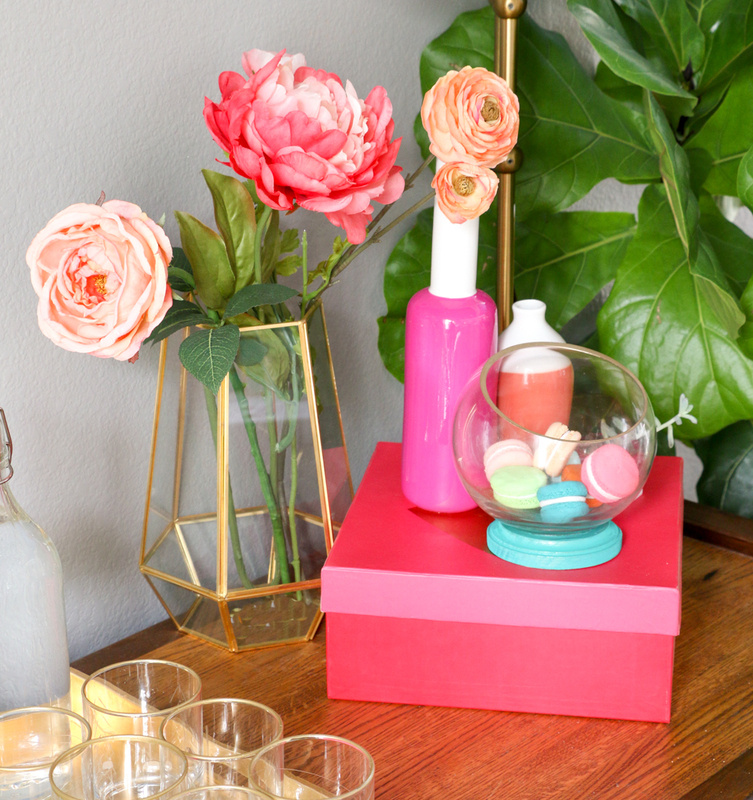 I propped it up on a mint and gold gift box for a little extra color and height and just had to surround the “vase” with a few little party animals from Oh Joy for Target’s new collection. 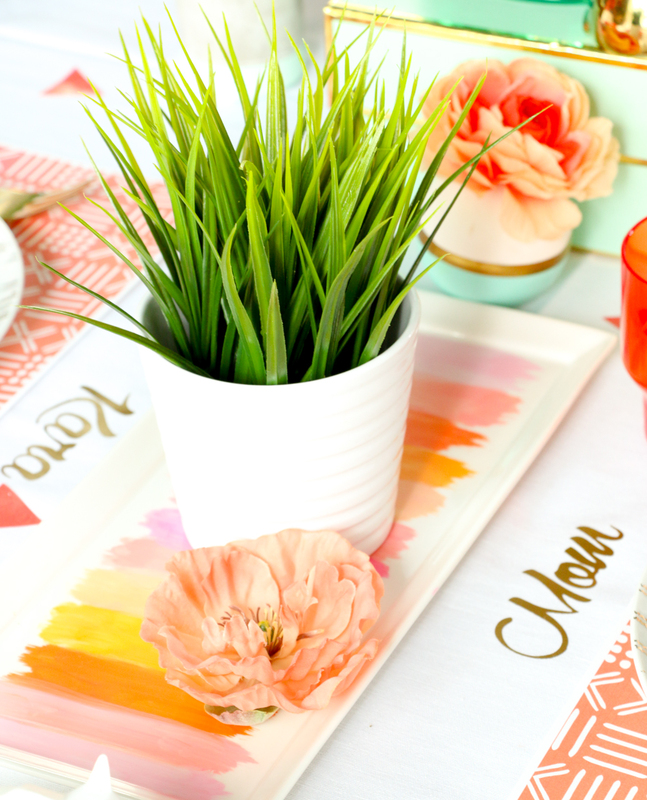 On either side of the centerpiece I have two of my DIY brushstroke serving plates with a few flower blooms and a faux grass plant. During the real meal these plants would be removed and brunch food like quiche and scones would be placed on these plates. Oh, and how fun are the temporary vinyl place cards that are actually on the table cloth itself? 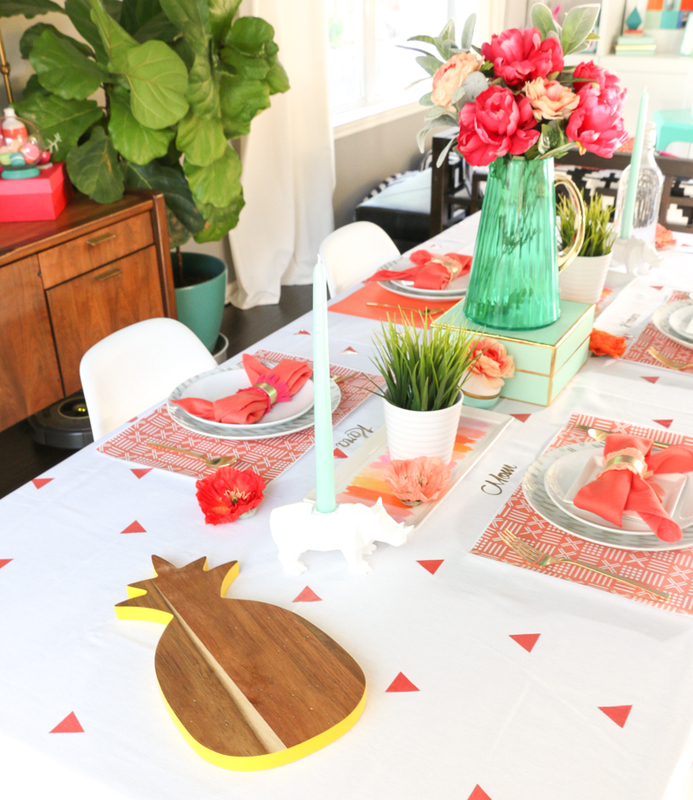 And last but not least is the table setting. 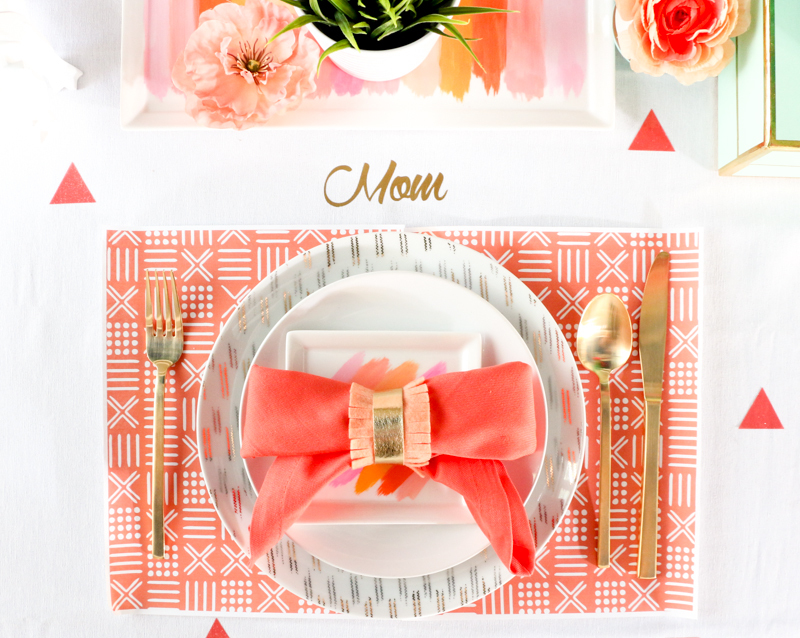 I designed a printable mud cloth place-mat in orange and white and printed it out onto 2 pieces of 8.5″ by 11″ paper. Then simply taped the two pieces of paper together to create a fun disposable place-mat. And bonus, I have it for you to download here and use for your own party! The rest of the table setting includes my gold flatware and dinner plate by West Elm, a plain white salad plate from Ikea, and the square brushstroke bread plate I made with a dish from World Market. Then on the top is my DIY fringe and gold napkin ring and bow folded napkin. 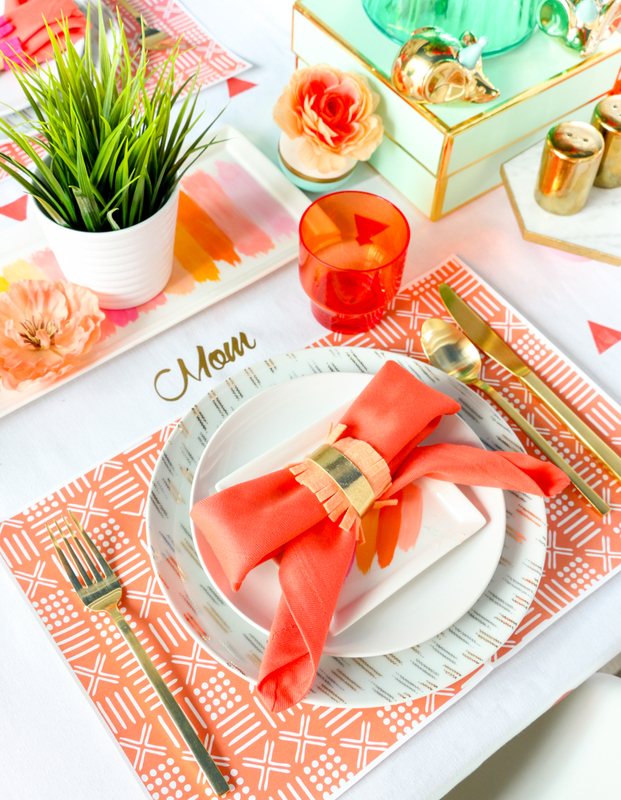 And that brings us to the end of the Mother’s Day brunch styled party. What’s your favorite part? Is it the balloon arch like me? I hope you enjoyed viewing all the elaborate details as much as I enjoyed putting it all together. And please feel free to comment and let me know if you would like to see more table settings and parties styled for different events or holidays. I am more than willing to accommodate your requests! How adorable is this! 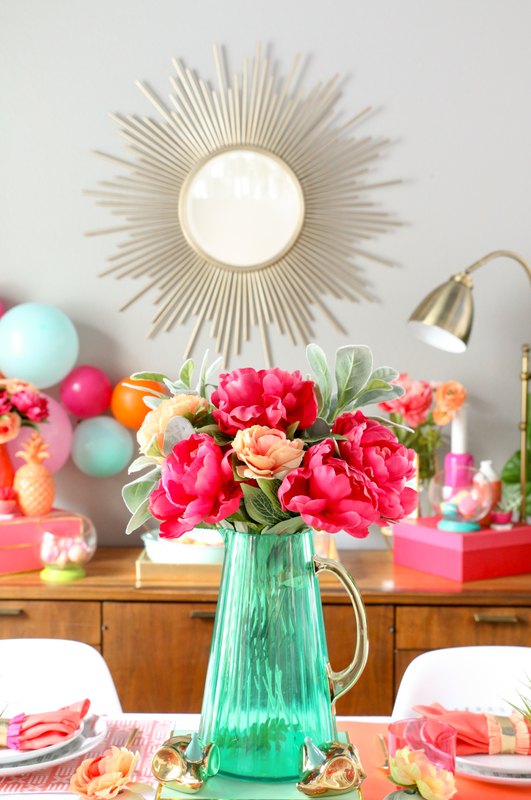 I love how you used so many bright, springy colors without it looking too busy! I'm gonna admit thought, I'm a bit jealous of your gold flatware! hahaha! Yeah, those were a splurge, but they look so good in photos!